As many of you know, I have been in school the last few months to renew my teaching credentials. The class I am taking right now is a class on teaching good health habits. My school is not " Christian" in any way. It simply teaches what is "scientific". However, yesterday, as I was reading my text book, it talked about how to live healthy by lowering one's stress. It said the research shows that people who attend church at least once a week and read their bibles and pray daily have less stress and on average live 7 years longer then people that do not have God in their lives. So science and research shows God helps us live healthier lives. Not to mention eternity after life. My kids and I read Proverbs each day and choose a section that we can think about throughout the day. In today's Proverb 8:8 wisdom speaks of her words not being crooked or perverse. When I think of the word perverse, I realize it means to use in a way not intended. I tend to use sarcasm often in my daily speech. Twisting words and not truly saying what I real think or mean. I thank God for reminding me with his word that this way of communication is not wise or effective. I hope to correct this habit and be more like Horton " I meant what I said, and I said what I meant." Daniel then said to the guard whom the chief official had appointed over Daniel, Hananiah, Mishael and Azariah, “Please test your servants for ten days: Give us nothing but vegetables to eat and water to drink. Then compare our appearance with that of the young men who eat the royal food, and treat your servants in accordance with what you see.” So he agreed to this and tested them for ten days. At the end of the ten days they looked healthier and better nourished than any of the young men who ate the royal food. So the guard took away their choice food and the wine they were to drink and gave them vegetables instead. You may already be familiar with this story in the Bible. If you want to read the entire story see the Book of Daniel Chapter 1. 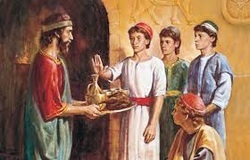 Is it a miracle or a coincidence that Daniel and his friends were the healthiest of the young men in the service of the King? Neither, the results of their choice to not eat the King's food and eat only vegetables was a real physiological effect. They reaped the rewards of what they put in their bodies. If you ate nothing but vegetables and drank only water for ten days, only ten days, you too would be the healthiest person in your household. Our family has experienced, first hand, what it is like to live with little physical energy and also what it is like to have tremendous amounts of energy. Immediately after giving birth to my second baby, I personally hit the lowest point in my health. I had next to no energy. Both my mind and my body were slow and sluggish. After a year of living this way, our family did a 21-day detox (which we had done in the past) and my energy level went through the roof! I started waking up at 5:00 AM without an alarm and feeling energetic until I went to bed at 9:00 PM. My mind was clearer and I was able to accomplish about five times what I would normally accomplish before the detox. My husband also experienced greater mental capacity and lost a little weight to boot. While we were doing the detox, he taught himself how to create websites and built six of them in one week! Although I have been doing this same detox for over 12 years, I find that each time I do it, I go through a deeper change in my life, my character, my habits or my devotion to God. 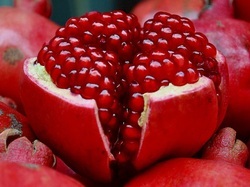 Cleansing out the body with live foods has benefits beyond the physical; it has very real spiritual blessings. Daniel and his friends experienced this too. I must admit that doing the detox wasn't always a walk in the park, but the results were worth whatever sacrifice I thought I was making at the time. The following Psalm was ever so true for me on many occasions. Psalm 126:5 Those who sow with tears will reap with songs of joy. If you are ready to reap increased physical energy and mental capacity, join us for a detox. Click here to learn more. Have you ever experienced this principle in your life? Have you sowed and reaped the benefits or adverse consequences of your actions? In health, like in any other area of life, this principle holds true. Whatever we put into our bodies is what we will reap from our bodies. What kinds of expectations do you have of your body? Do you expect it to get up early in the morning or stay up late at night? Do you expect it to perform in a sport or at the gym? How about stress? Do you expect your body to manage every day stresses and pressures? Do you expect your body to get up every morning with enough energy to get you through the day? If you haven't thought about this lately, you might pay attention to what happens to your energy around 3:00 PM on a work day. Are you reaching for a snack, a cup of coffee or a chocolate bar to get you through the afternoon? If the answer is, yes, you will want to read on. The energy that our bodies use to perform every day tasks comes from the foods we eat, so the higher the quality of the food, the higher the energy our bodies will have. Take a look at the pictures below. 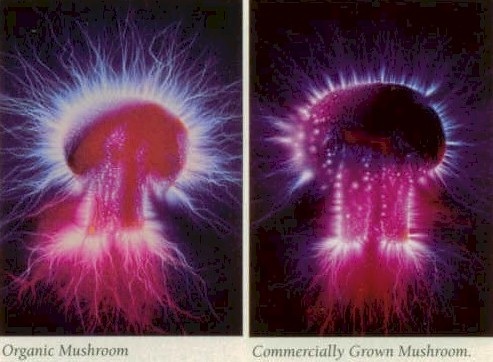 Kirlian photography makes it possible to see the energy in each of these mushrooms. 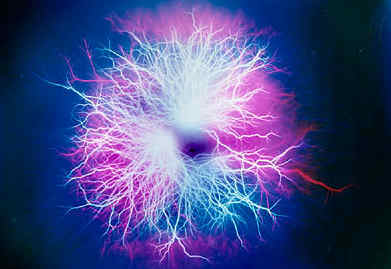 It is evident that organic foods have greater energy than non-organic foods. The picture below shows how uncooked, live foods have greater energy than even slightly cooked foods. When we talk about live foods, we are referring to foods that have not been cooked in heat higher than 112 degrees Fahrenheit. Any food cooked at higher temperatures is basically dead because its enzymes, probiotics and some vitamins and minerals are no longer alive, rendering the food ineffective for truly nourishing the body. Check out the high levels of energy coming from this organic goji berry. This amazing little berry is considered a superfood; you can see why. The bottom line is, if you want to have greater physical energy, you must feed your body high energy foods which are live, uncooked and organic. Organic foods are not always within reach or within budget, however if you would give live foods a try, even of they are not organic, you would experience a greater level of energy. You might think about how to incorporate live foods into your every day eating. The Bible has one great example of this principle at work. Stay tuned for Part 2. We have received many questions about the use and need for enzymes. Here's a crash course. Enzymes are responsible for every chemical reaction in the body, including digestion. Sometimes enzymes can act as catalysts for various functions in the body to speed up or slow down the function. Our bodies produce some digestive enzymes, but it needs the live enzymes in the foods we eat for proper digestion. Cooked foods are devoid of necessary enzymes because enzymes die at temperatures of over 112 degrees. People who eat primarily cooked foods are enzyme deficient. Raw foods are also called living foods because all their enzymes are alive. Have you ever seen a piece of fruit mature to the point of getting mushy? That's the live enzymes working on the fruit. It is self-digesting! When a body is enzyme deficient, the following symptoms will appear: cysts, abnormal fat deposits and leaky gut syndrome (when large intestine leaks blood). Not all brands of multi-enzymes have the same ingredients in them, but if you get the top six, that's good for starters. If you decide to start taking enzymes, make sure that the bottle is labeled plant based or vegan (vegan enzymes will not include ox bile). We take three capsules of the enzymes with each meal, but we recommend that anyone who eats mostly cooked foods takes 6 capsules of enzymes with each meal. If you are interested in doing a little more studying on this issue, you can start by clicking here. Click here to see the real-life testimonial of our sister Donna Boelke who gave enzymes to one of her kids, who had a cyst on his throat. Good Morning! This is the Daily Manna today. It is so appropriate to our Health and Wellness Ministry. Have a wonderful day! Brothers and sisters, God has shown you his mercy. So I am asking you to offer up your bodies to him while you are still alive. Your bodies are a holy sacrifice that is pleasing to God. When you offer your bodies to God, you are worshiping him. Don't live any longer the way this world lives. Let your way of thinking be completely changed. Then you will be able to test what God wants for you. And you will agree that what he wants is right. His plan is good and pleasing and perfect. I appeal to you therefore, brethren, and beg of you in view of [all] the mercies of God, to make a decisive dedication of your bodies [presenting all your members and faculties] as a living sacrifice, holy (devoted, consecrated) and well pleasing to God, which is your reasonable (rational, intelligent) service and spiritual worship. Do not be conformed to this world (this age), [fashioned after and ada pted to its external, superficial customs], but be transformed (changed) by the [entire] renewal of your mind [by its new ideals and its new attitude], so that you may prove [for yourselves] what is the good and acceptable and perfect will of God, even the thing which is good and acceptable and perfect [in His sight for you]. I finally did the 21 Day Detox! After much procrastination (mainly because I thought I couldn't do without my daily 2-3 cups of coffee, meat and donuts for 21 days! ), which after a few days on the plan, I didn't even miss! I knew I had to do something to break my food addiction, when I was making late night runs to the local donut shop for my glazed donuts! Thus, on August 30, 2010 I was resolved to begin my detox. The 21 Day Detox was an amazing journey for me physically, spiritually and emotionally! Among the rewards I gained from the 21 Dat Detox: I sleep better, deeper relationship with God, have mental clarity, my blood pressure went down by 15 points, I lost eight pounds (this is a by-product of this program -- a nice reward as well), I wake up refreshed, my joints feel better, etc. I feel like a whole new person -- it's truly been life changing! Truly the BEST GIFT I could give myself! In order to be successful, I had to daily be resolved to follow the plan for myself, not for anyone else! You will be tempted; but remember to not to let anything or anyone deter you from your goal to cleanse your body for improved health and wellness -- your GIFT to YOURSELF. The benefits/rewards will be well worth it! To be successful, first get your mind ready to do the detox, get the food items you need beforehand, and have fun with the 21 Day Detox journey! Pray daily and take one day at a time. You will be pleased with your new and improved health, mind and spirit! I am! 1. Don't let yourself get hungry. Eat/drink as often as you like on the plan using the items on the plan (every 2-3 hours or more often, as needed). 2. Be prepared. Bring your food/snacks with you when out for long periods or when eating out. My name is Ty Howard and so far I have been eating raw foods for about two months with the help of our wonderful Health and Wellness ministry. The 21 Day Detox led me to learn more about how delicious and tasty raw foods can be. I received many excellent recipes from Masoud and Ruth during the program. I even went further and found an excellent, easy to read book, Raw Food Made Easy for 1 or 2 People by Jennifer Cornbleet. This book gave me many tips on how to set up my kitchen for preparation of raw foods. For example, just to know you have the proper equipment, utensils, and ingredients available as well as how to use them effectively sets your mind at ease. Jennifer states that storing equipment in the part of the kitchen you will use it, reduces movement and increases efficiency. I personally keep my blender on the counter by the sink and my chopping board near my knife block. Since I have limited space, I use my dining table for the food processor, my utensils, my various bowls with dried fruits, nuts, seeds, spices, oils, vinegars and sweeteners and seasonings. I wash my fruits and vegetables prior to the whole process in following the recipes and measuring the ingredients, this way I save time and energy. Since you will do a lot of chopping and blending plastic bowls are essential for sorting and storing. I liked the way Jennifer lists all the kitchen staples and even has a section on weekly grocery shopping for some of ingredients used for the recipes in the book. The recipes were simple and easy to follow, especially for a beginner like me! My name is Glenda Hurtado. I learned about the 21 Day Detox through our Health/Wellness Ministry at church. I became very much interested because I was desperately looking for an alternative to alleviate my 12 long years of migraines. The only concern I had when the detox began was that I was going to be out of town on week three of the program. I had already planned a vacation trip to Florida, and I didn't want to struggle with not being able to finish. Before beginning the detox, I consulted with Dr. Masoud about the challenge ahead, he was more than supportive, and gave the the okay to move on with the 21 days. I got all the necessary materials I needed before the trip, and made sure I had a blender in the hotel room. My family and I were blessed with a full kitchen in the resort we stayed in. The first thing I did every morning before going sightseeing was my morning smoothie. I loaded up my smoothie with the basic ingredients: banana, goji berries, purified water, and almonds. I carried a few detox tea bags in my purse just in case my family stopped for a meal, I could have something to sip on while they ate. I made sure I did not go into starvation mode so I would keep myself hydrated all day long. We did a lot of sightseeing: went to Orlando, Tampa Bay, Daytona Beach, and a couple of parks. I would make my energy soup before we would leave the hotel room and carried it with me in a little ice chest purse I had taken with me. I made sure to keep full or to have my liquid meal before going out to dinner, so I wouldn't get tempted. Another tool I would recommend is to stay in contact with people that are going through and understand what you are going through as well. The whole trip I communicated with my detox buddy. She helped me through those moments of weakness. I think the key to a successful detox for me was to always be prepared; mentally, emotionally, physically. I have been headache free for 44 days!!!! I feel great. I have gotten so many complements to the point that people think I have gotten Botox. My body is actually doing what it was meant to do without all the extras that I was putting in. Thank you Dr. Masoud and Ruth for the knowledge, support, guidance, and love I have received from each of you. Check out this recipe for dessert. Fast and easy to make. Looks exotic and tastes yummy. Mix the dragon fruit, mango and diced mint. Garnish with strawberry and mint. In retrospect, I would have drizzled some raw honey for added sweetness. It hits the spot on a hot day! 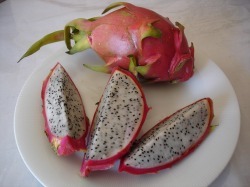 My husband introduced me to the wonderful dragon fruit today. Being completely unfamiliar with the fruit, I had to be taught had to open it and eat it. Click here for instructions. This delicate fruit is a complete surprise - pink and green on the outside, white and black on the inside. Its consistency is that of a soft pear and it tastes like nothing I've ever tasted before. Pick one up at you local grocery store or you can get one online.